A typical SharePoint farm contains large amounts of sensitive data. You need to make sure the level of security reflects the importance of the data. Conducting regular SharePoint security audits will help you stay on top of security issues that could put your data at risk. And the right SharePoint security reporting tools can automate the auditing process, making it both more efficient and more reliable. 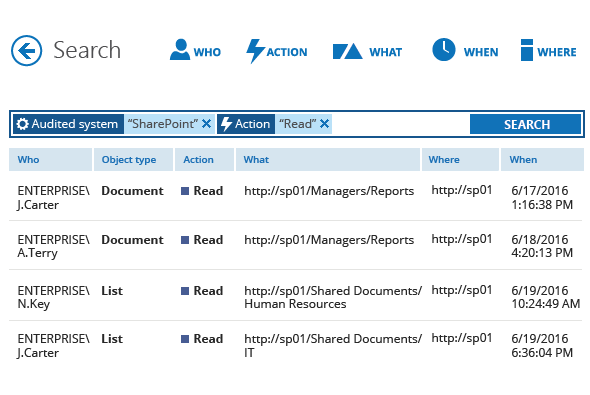 Monitoring your Microsoft SharePoint Server items with native audit log reports can help you understand who has done what with sites, lists, libraries, content types, list items and library files in your site collections. However, using native SharePoint reporting for security auditing has important drawbacks. First, the reports are Excel-based, so you have to be prepared to work with bulky Excel spreadsheets and filtering options. Not only is this process time-consuming, but it also increases the risk that you will miss suspicious user activity or other important information in all the noise of routine events. Moreover, native tools don’t provide critical functionality, such as alerting, report subscriptions and search across all collected data, that can help you detect suspicious activity in its early stages and investigate an incident in time to mitigate the damage. Therefore, investing in third-party SharePoint security audit tools can be a wise decision. The Netwrix Auditor SharePoint security tool makes the task of hardening security much easier by giving you visibility into changes to content, changes to SharePoint permissions (including permissions assigned directly to users and those inherited through SharePoint groups), and access events. In addition, it empowers you to detect suspicious activity in its early stages so you can respond promptly. You can even set up alerts on activities you consider risky, and subscribe to the predefined reports you want to review on a regular basis. Netwrix Auditor includes a variety of SharePoint security reports out of the box, and you can also use the Interactive Search feature to build your own custom reports. Moreover, the Netwrix Auditor platform gives you a single-pane-of-glass view of changes in many other applications and systems, including Office 365. This level of visibility helps you harden your security posture: You can spot suspicious activity across the entire infrastructure, easily view all the critical details, quickly investigate potential incidents or threats, and take appropriate steps to remediate any unwarranted incidents and prevent similar issues from happening in the future.